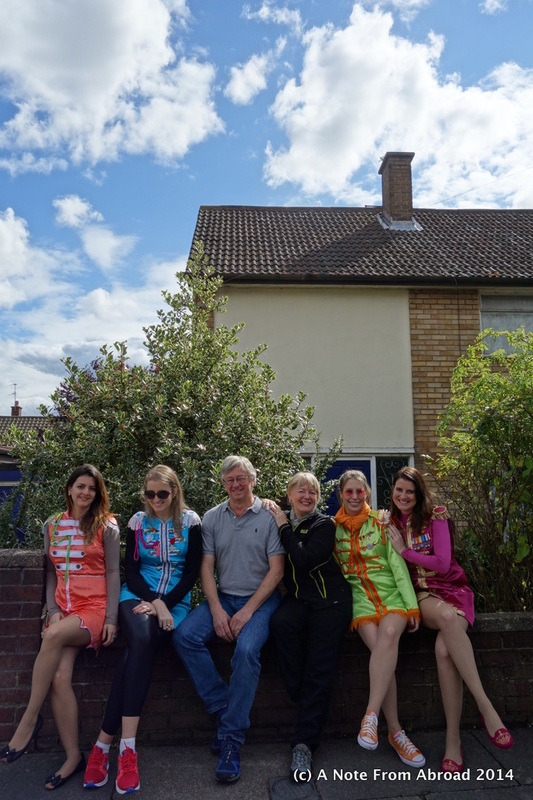 Promptly at 10:00 in the morning our tour guide/taxi driver Debbie picked us up at our hotel for our Beatles Fab Four Taxi Tour. 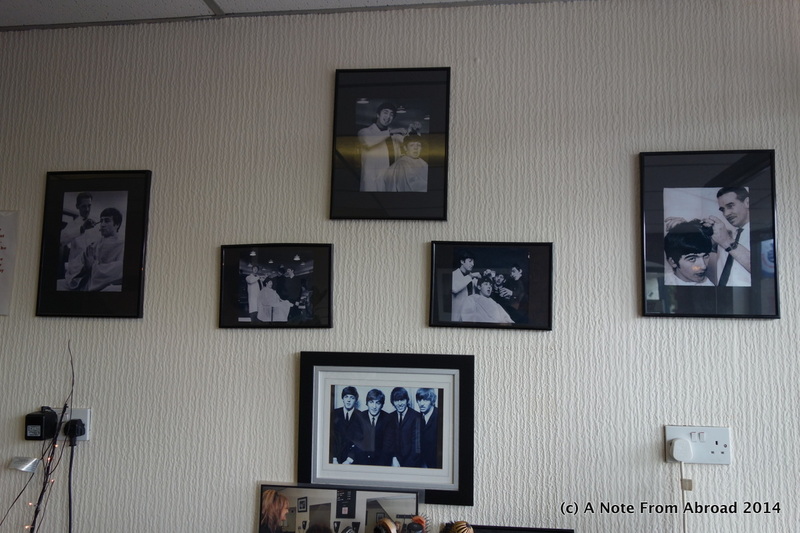 Debbie explains to us that we will be visiting the childhood homes of all four of the lads, hearing some of the stories behind the lyrics, visiting memorable sites such as Strawberry Fields, the barber shop where their signature mops were sculpted, Penny Lane as well as a few other places significant to their music. 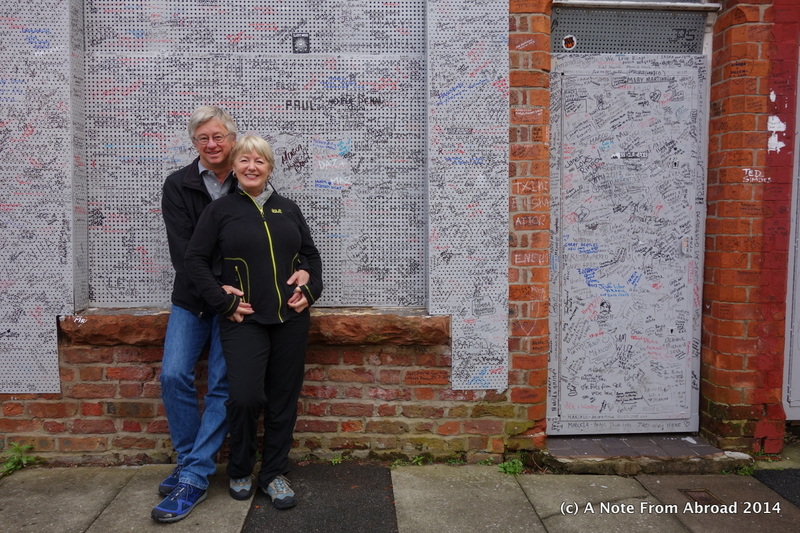 With a medley of Beatles music playing, Tim and I sang our way down the road toward our first stop, the childhood home of Ringo Starr. Located in a poorer part of town, that had been largely occupied by dock workers in days gone by. Several blocks in this area are now boarded up and plans are on hold as to whether or not the buildings will be knocked down or rehabbed. Born Richard Starkey, his parents separated when he was quite young. His mother then moved the family a short distance into a smaller, but nicer location. A sickly child, Ringo spent some time in hospital for treatments, which resulted in his education being severely handicapped. Getting interested in the skiffle craze, in 1957, he cofounded his first band, the Eddie Clayton Skiffle Group. Ringo sang lead vocals on both “Yellow Submarine” and “With a Little Help from My Friends”. 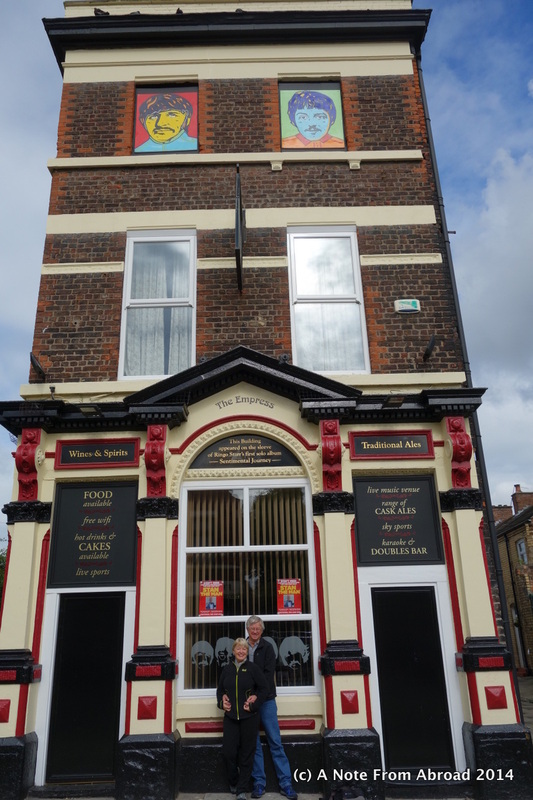 This building was featured on the sleeve of Ringo’s first solo album, “Sentimental Journey”. Known as two of the finest lyricist of all time, both Paul McCartney and John Lennon were asked to write a song highlighting some of their childhood memories. 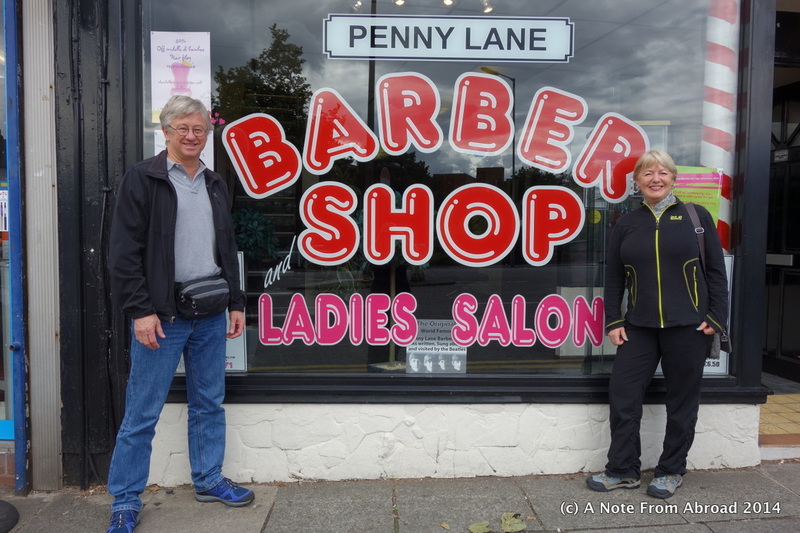 Paul penned “Penny Lane” where he included references to the barber shop. John Lennon had a challenging childhood. 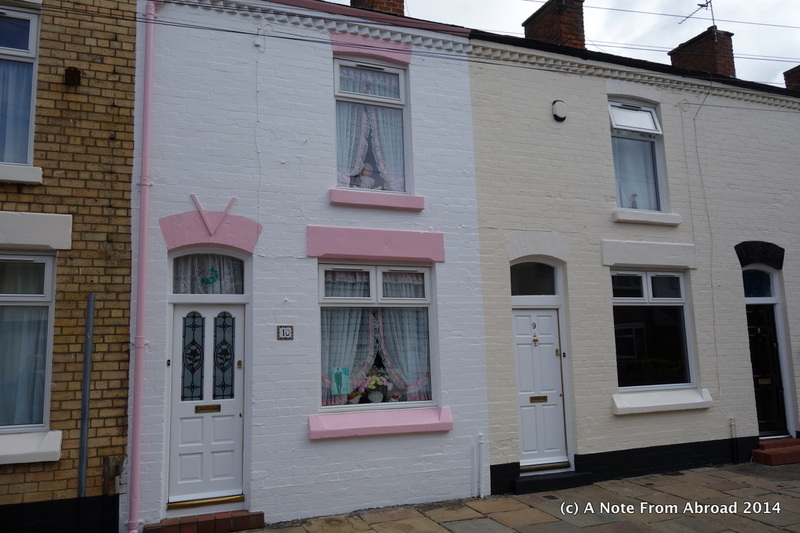 Distanced from both of his parents, he was sent to live with his Aunt Mimi in this house. Always the class clown, John was known for getting into trouble, or causing a ruckus. George Harrison was the lead guitarist for The Beatles. This is the church building where John Lennon and Paul McCartney famously met on July 6th, 1957. John thought that Paul was too young, but after Paul picked up a guitar and played for John and the other band members, he was asked to join the group. Just across the street from where they met is a church and graveyard. John had been kicked out to this church for stealing money from the offering plate to buy bubble gum. In the graveyard are two tomb stones famously referenced in their hit, “Eleanor Rigby”. And that song that John Lennon wrote about his childhood??? 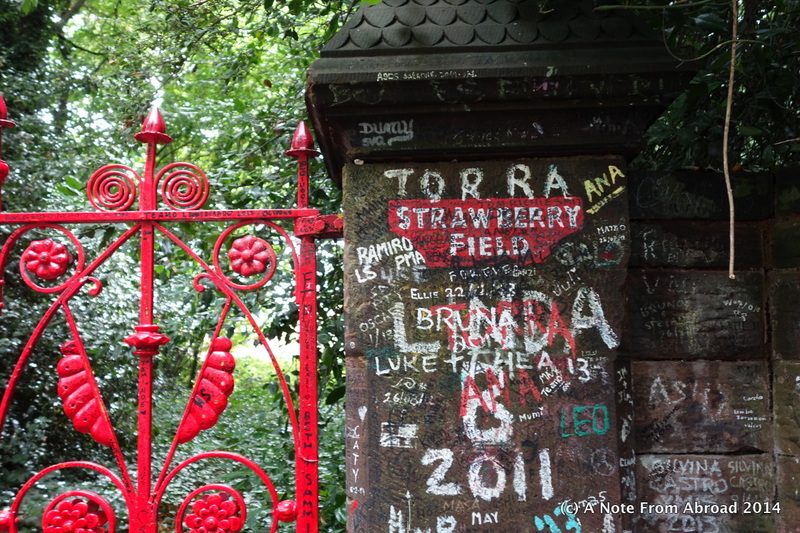 Strawberry Fields Forever! Just a short distance from where John lived with his Aunt Mimi, John would often hop over the fence to play with the boys that lived there. The headmaster would kick him out, and repeatedly went to Aunt Mimi to complain about John’s behavior, even finding him hiding under one of the beds in the home. We had booked for a two-hour private tour, but it turned out to be three very enjoyable hours. Debbie did a wonderful job of bringing the story of The Beatles to life plus taking a lot of pictures for us. I highly recommend doing this tour. 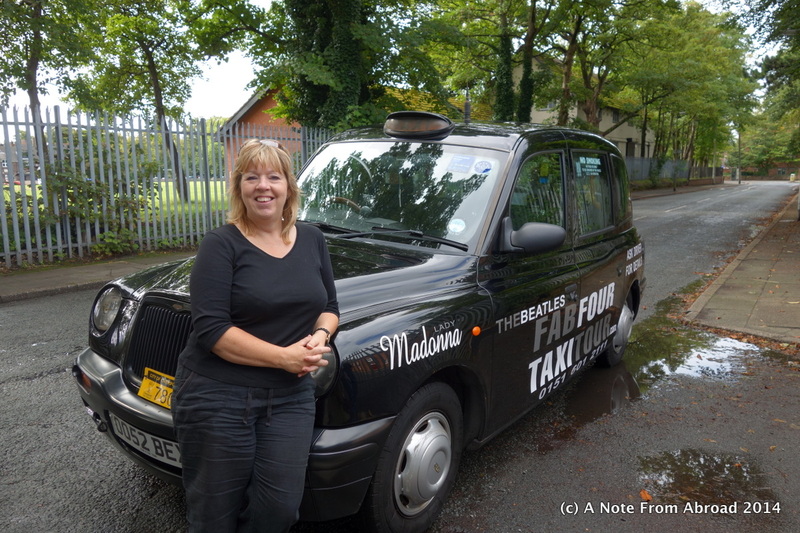 Click here for a clip from an interview with our driver Debbie. Price: Tours start from £45 per cab for a 2 hour tour. The cab will hold up to 5 people. They have a variety of tours, as shown on their website. Gratitude Moment: Today I am grateful for being able to relive some happy childhood memories through amazing music. It was so fun to learn more about The Beatles and hear the stories behind some of their famous songs. 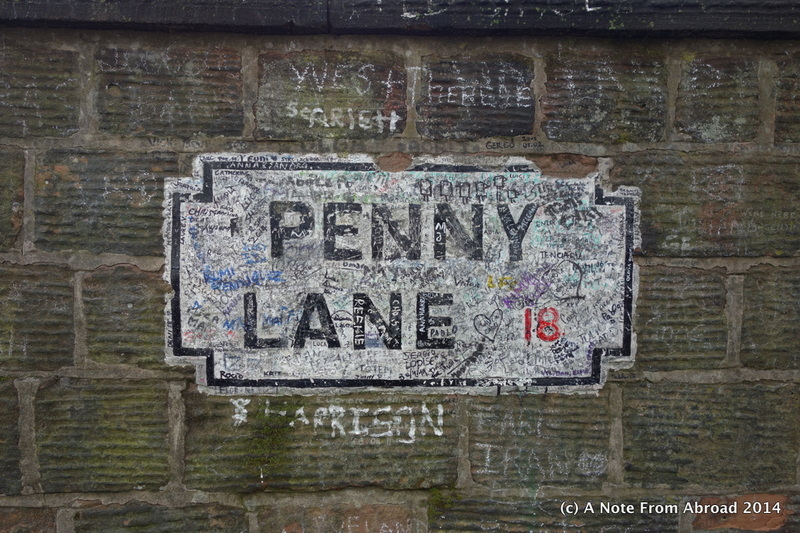 This entry was posted in England, Europe and tagged Beatles, Beatles Tour, Eleanor Rigby, England, Fab Four, George Harrison, John Lennon, Lady Madonna, Liverpool, Paul McCartney, Penny Lane, Photography, Ringo Starr, Strawberry Fields, Strawberry Fields Forever, The Beatles, Travel. Bookmark the permalink. What a cool experience! Thanks for including some of the background that you learned on the tour! I’ve been a lifelong Beatles fan and this is something that’s on my bucket list. I recently saw Abbey Road in London, but we didn’t make it to Liverpool. I’ll have to do this next time! Candie, if you are a Beatles fan, than this is a “must do”. I really only covered a portion of the things we saw and learned. It is well worth the time. Fascinating photos and anecdotes, Joanne. 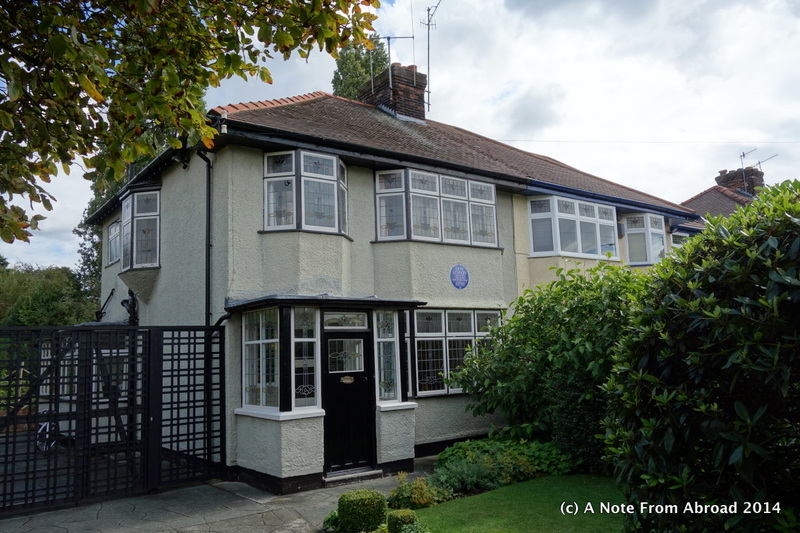 So, do people live in those Beatles houses and at Strawberry Fields? And in the graveyard, is the grave two stones down from Ms. Rigby’s notation that of Father McKenzie’s wife? 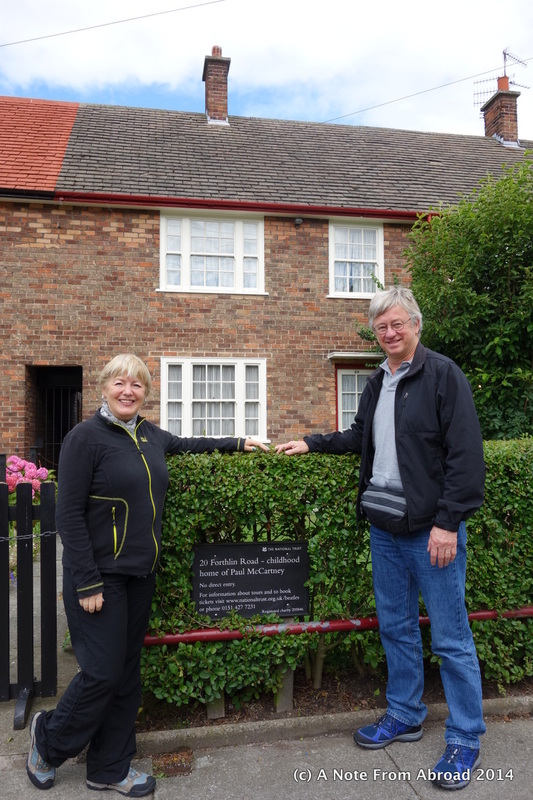 Mike, two of the homes are now owned and maintained by the English Trust who offer daily tours by appointment. The first Ringo Starr (Starkey) home is empty and boarded up. The second Ringo home is privately owned, as is the former George Harrison home. The Eleanor Rigby stone is one row over from the McKenzie family stone. 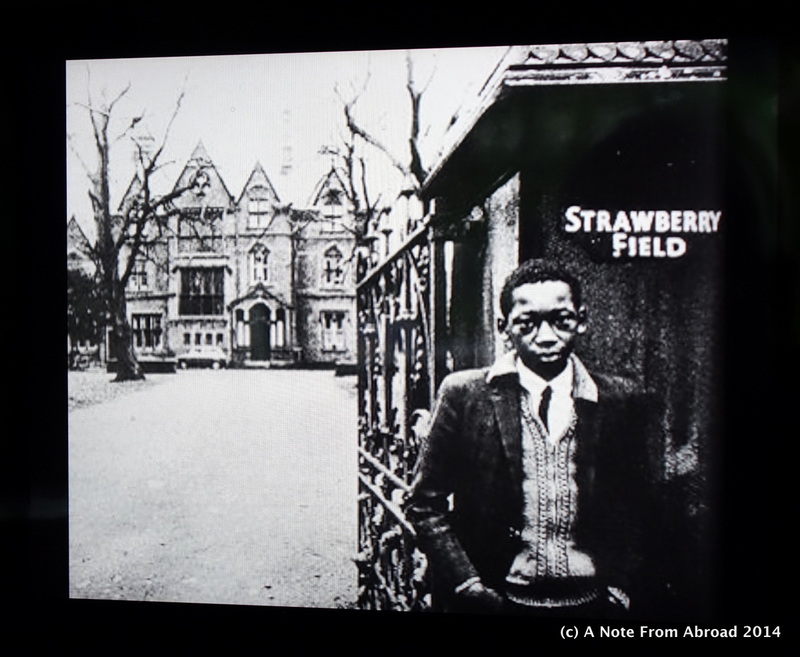 Strawberry Fields has a different building on it today, and I’m sorry, I can’t remember what it is used for. I didn’t realize, but should have, that most of the songs they wrote were about their childhoods. My Mother loved the Beatles and I remember seeing them on the Ed Sullivan show, I think that all of America was watching that night! Don’t put too much in your suitcases, I don’t want to smother, am so enjoying your vacation. I can vividly remember seeing The Beatles on the Ed Sullivan show. I had a huge crush on George. My father hated their long hair, but I think my mother loved their music as much as I did. Such fun memories!